Personal hygiene is important for adults, but perhaps even more important for babies whose immune systems are just developing. Once you bring a baby home from the hospital, you will want to keep your home clean and safe for your infant at every state of his life. Here are 15 ways to childproof your home for a healthier, safer environment for you and your little bundle of joy. 1. Wash clothes. Dyes and sealants used in baby clothes could be irritating to your child’s skin so clean all outfits, booties, blankets, towels, etc. before your baby arrives. Use an allergy-free detergent that is without perfumes or dyes. 2. Sanitize toys. As your baby grows and plays with toys, sanitize them once a week or more often if other children come over to play. This will ensure that anything babies put in their mouths stays clean over time. 3. Cover outlets. Keep little fingers away from dangerous electrical outlets by using safety covers. 4. Remove breakables. When your baby becomes more mobile, make sure to remove any objet d’art in your home that is breakable or has sharp edges. 5. Install cabinet locks. Ensure that your toddler can’t get into a cabinet where he will have access to cleaning solutions or other potentially dangerous products by installing cabinet locks. 6. Use a stairway gate. An open staircase is an accident waiting to happen. 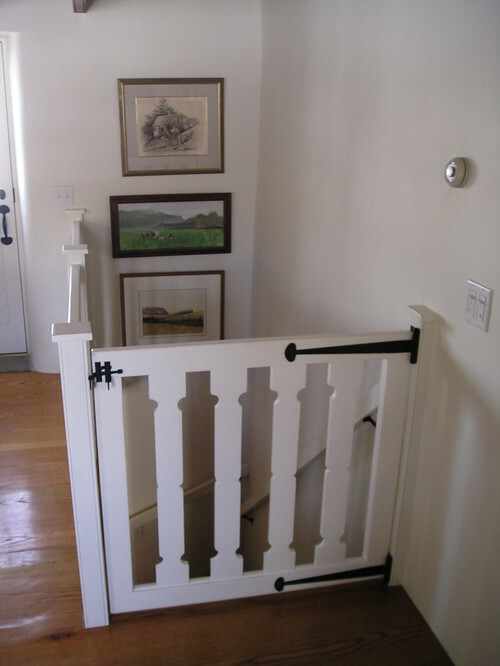 Always us a baby gate to keep your infant safely away from stairs. 7. Secure heavy furniture. When babies are learning to stand up, they use furniture to pull themselves upright. Make sure heavy bookcases and dressers are secured to the wall, and leave lower shelves empty. 8. Secure pull cords on blinds. Anything that dangles, like a pull cord for your blinds or tiebacks for your draperies, can become a strangling threat to little ones. Make sure strings are secured and out of reach. 9. Use padding on sharp edges. You can put portable bumpers around sharp coffee table edges and fireplace hearths so your little one doesn’t bump his head when crawling or learning to stand up. 10. Invest in a portable playard. These convenient pieces of baby equipment are essential for giving you a safe, clean place for baby to nap or change a diaper. 11. Keep tiny objects out of reach. Babies are curious by nature. Make sure an older sibling doesn’t leave small game pieces on the floor or anywhere your infant can get to them. Small objects are potential choking hazards. 12. Vacuum, sweep and mop often. Keeping your floors clean is essential when you have a baby who spends lots of tummy time or crawling time on the floors. Remove dirt, pet dander and crumbs on a regular basis using a chemical-free cleaner when you mop. 13. Keep medication out of reach. As with chemicals, always keep medication out of reach of children of all ages by storing up high in childproof cabinets. 14. Make sure all baby equipment is washable. To keep bacteria from growing and to remove allergens, pet dander and spills, car seats, playards, fabric toys, sheets and pillows should all be washed and washed again after your baby uses them. 15. Don’t leave your purse where baby can reach it. Your purse or a visitor’s can contain potentially dangerous things such as lipstick, coins, hand cream and other items a baby might want to put in his mouth. Whether it is keeping your environment clean, or keeping it safe – or both – your family will be happier and healthier when you take a few extra minutes each day to make sure your home is safe for your children at all stages of their lives. Teresa Stewart writes tips for new parents to help keep babies and toddlers safe at home. Ingenuity, found online at https://www.target.com/p/ingenuity-washable-playard-with-dream-centre/-/A-14580284, showcases products with easy to remove cloth liners and covers that are conveniently machine washable. Previous The Pros and Cons of Dental Assisting School: Are You Ready for a New Career?